Are you your friends' go-to when they need a sitter? Are you looking for a flexible way to bring in some extra money? Have you considered babysitting as a part-time job? More and more parents are looking for great sitters they can trust and having a hard time finding one. 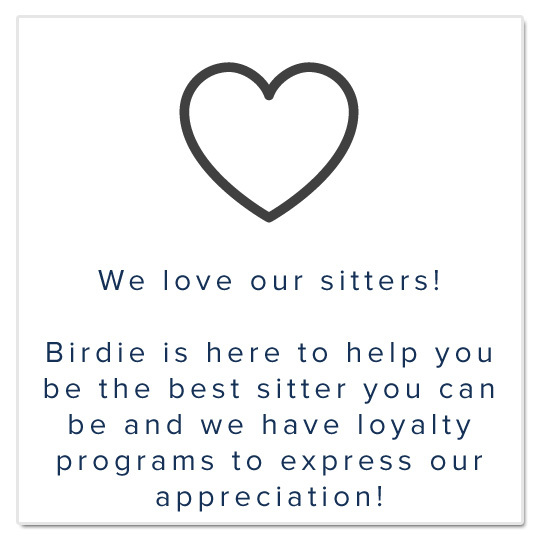 If you are one of these sitters, Birdie can be the avenue that connects you with those families. You send us your availability and set your own hourly rate, we find you the sitting jobs. Payments are made online and deposited into your account. We are just beginning the journey to complete our mobile app and thus are starting with bookings through the website. Once it is up and running, all bookings, availability updates, profile access for both the Sitter and the Parents and payments will be done via the app. Now recruiting sitters in both Calgary and Edmonton, AB! Sitting is a great option for a part-time job (or full-time for those ambitious enough!) - you choose your own schedule and set your own hourly rate; everyday is different and fun! Becoming a Birdie sitter has all the benefits of having a lucrative part-time gig with none of the downsides! We find you the families, connect you to them according to your availability and handle the payments which then get deposited directly into your account. You keep all your hourly fee! We know you understand that parents want to make sure their children are being taken care of by sitters with great qualifications! Simply fill out the application form by clicking on the link below. We will then contact you for a discussion about Birdie and to learn more about you. Birdie can help you get your required certifications, if you don't already have them, and point you in the right direction for your background checks. Once both parties are happy about the partnership, we start making you available to parents to book for sitting sessions!